MetroLALSA proudly presents Pa’lante VIII: Unidos Venceremos, which will be held at CUNY School of Law on Saturday, April 14th, 2018. This year’s theme Unidos Venceremos, serves to show us that if we work together and help each other, we can ensure the advancement of our community. We want to encourage the Latino legal community to join forces so that together, we can overcome the issues facing our community especially those currently affecting Puerto Rico. With our Pa’lante VIII Conference, we seek to unify the Latino legal community to help and strengthen each other in order to close the Latino gap in the legal profession. Our panels and agenda for this year’s conference will be reflective of the legal concerns and interests that we have as a community. MetroLALSA’s ongoing mission is to empower and unify the Latina/o legal community. The Pa’lante Conference is the central forum to achieving those goals. MetroLALSA is honored to have Jose Luis Perez, Deputy General Counsel for LatinoJustice PRLDEF, be our keynote speaker for Pa'lante VIII. From his commitment to public service for the past 33 years, especially as the lead lawyer in a number of ground-breaking immigrants’ rights cases, Mr. Perez inspires many Latinos in the legal profession. He has served as Legal Director of LatinoJustice PRLDEF for the past decade and has mentored countless high school, college, and law students and new lawyers of color over the years. Additional speakers will be announced in the coming weeks including the honoree of this year’s Liderazgo Award. In addition to our Keynote speaker, we are also honored to have many influential and key individuals join us for the panel discussions. The panel discussions will provide legal professionals with the opportunity to earn between 1.5 to 4 CLE credits. At the conference, we will also be awarding our annual Pa’lante Scholarship to a deserving law student. Additionally, our pipeline program integrated with the conference, is designed to give students and professionals interested in pursuing law school an opportunity to speak with law students, legal professionals and law admission officers and to attend a mock 1L class. All attendees will have an opportunity to network, especially during the organization fair. Continental breakfast and lunch will be provided. 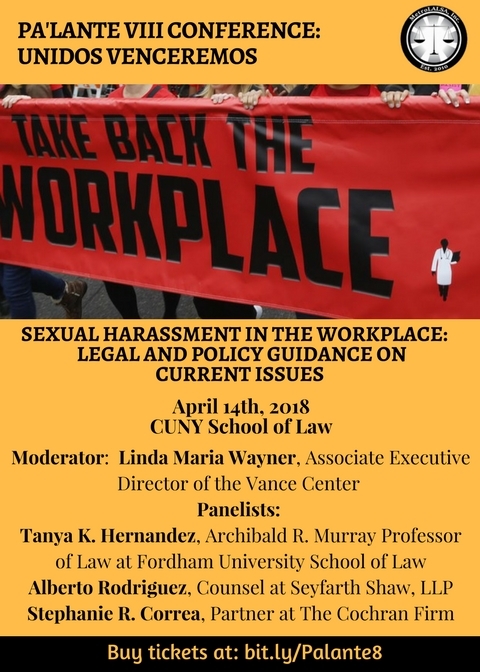 If you have any questions regarding the conference, including registration, please contact Blosmeli Leon-Depass, Conference Chair, at blosmeli.leon-depass@live.law.cuny.edu. BUY YOUR TICKET NOW AT A DISCOUNTED PRICE BY REGISTERING HERE. DOWNLOAD OUR PA'LANTE VIII SPONSORSHIP PACKET HERE. Click through the gallery below to view the panel topics and panelists for this year's Pa'lante VIII Conference: Unidos Venceremos, including the workshop, Legal Writing and Persuasion: Best Practices for Success. CLE Credits provided by Community Legal Resource Network at CUNY School of Law. This CLE program is approved for both experienced and newly admitted attorneys. Under Continuing Legal Education regulations, CLE credit will be offered only to those attorneys completing entire sessions; attorneys attending only part of a session are not eligible for partial credit. Attorneys arriving late are welcome to attend the program but will not be eligible for credit. Attorneys must sign in and sign out of the session in order to receive their certificate of attendance. Click through the gallery below to view the pipeline program content and the panel descriptions for this year's Pa'lante VIII Conference: Unidos Venceremos.